We've all cut corners on our school projects. We used Wikipedia, frantically scribbled down Konnie Huq's monologue on tortoises whilst watching Blue Peter, and then quite literally cut the corners off paper so the page was smaller. But one American child has gone too far, making an outrageous claim in his school project to which we can only respond: CITATION NEEDED, YOUNG CHILD, CITATION NEEDED. The image was posted to Reddit by /u/bijanthepigeon with the caption: "My mom is a middle school teacher and this was on a project a student turned in". 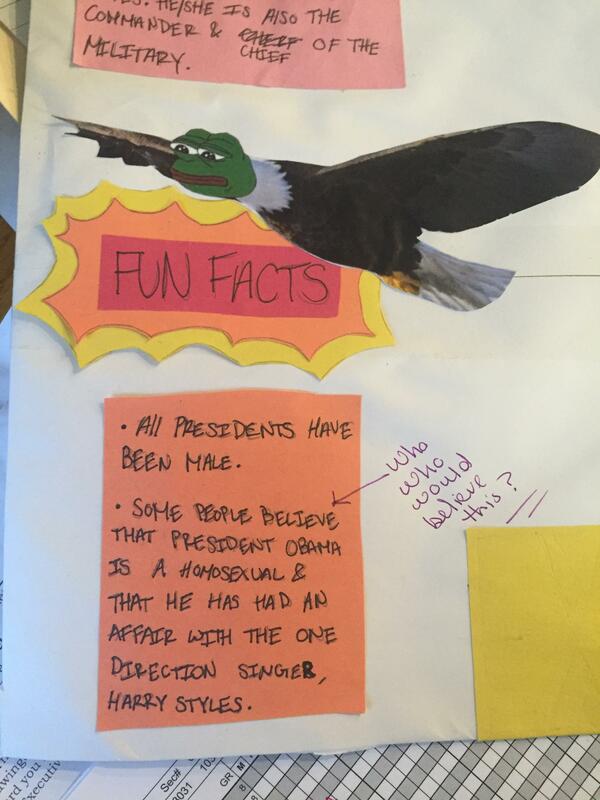 Under "Fun Facts" the child had written: "Some people believe that President Obama is a homosexual & that he has had an affair with the One Direction singer, Harry Styles". The teacher responded, with admirable restraint: "who who would believe this? ", somehow not getting tear splashes on the page as she wept for our future.